Steel Rolex Oyster Perpetual 177200 mid size. Case diameter 31mm water resistant to 100 meters. Automatic chronometer movement. 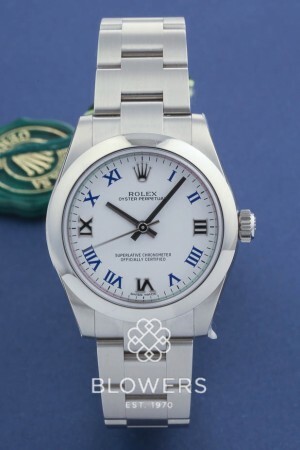 White dial with blue roman numeral hour markers. Steel polished bezel. Brushed steel Oyster bracelet. Box and papers dated Novermber 2016. Pre-owned UNUSED. Our reference S21019. SKU: 3005068. Categories: Ladies, Oyster Perpetual, Rolex.